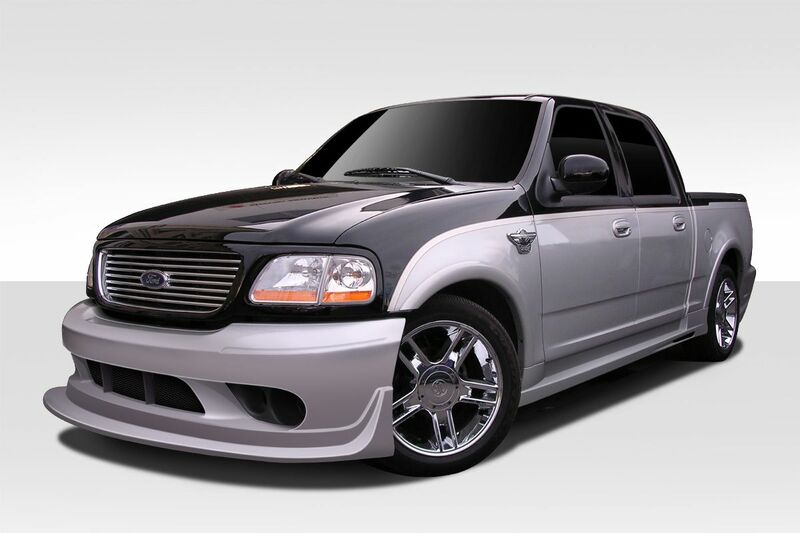 Looking for an F150 body kit to make your truck stand out from the crowd? Look no further than Duraflex for all your F150 styling needs. 1997 marked a big change from the boxy design F150 of previous generations to a more smooth and modern design. This also marked a new wave of customization of full size trucks as the F150 has perennially been the best selling truck in the world. The designers at Extreme Dimensions stepped up and released several F150 body kit styles as well as replacement hoods. One of the most popular upgrades for F150 owners that go for a street truck hot rod build is lowering the truck’s stance and replacing the chrome bumper with a styling front bumper cover body kit. We offer 2 styles of front bumper for the 97-03 F150. The most popular style front bumper for the F150 is the Cobra R style. Similarly this design came from the popular Mustang Cobra R of the same era and translated that styling over to the F150. Far and away our most popular selling parts for the 97-03 F150 are the fiberglass hoods we offer. We currently offer 7 unique style light weight fiberglass hoods. Styles include cowls which add additional engine bay clearance as well as vented hoods that aid in cooling the engine bay. A vented hood improves cooling efficiency by allowing cool air in and providing a path for hot air to escape.